between Qantas and each of the unions (after a statutory negotiation period had been exhausted). The title of this article owes something to the heated nature of the Qantas dispute, which was ratcheted up by Qantas CEO, Alan Joyce, in a speech in April 2011. Joyce attacked the three unions for running a ‘kamikaze campaign’ based on ‘completely unacceptable’ bargaining demands. This was a reference to the central issue in the dispute — the unions’ claims for enhanced job security protections — which Joyce labelled as ‘commitments that would kill the jobs of their members’. In turn, Joyce was labelled by the AIPA as a ‘madman’ following the grounding of the airline’s fleet. Prime Minister Julia Gillard went so far as to describe Qantas’s actions as rogue corporate behaviour that was unjustified under the Fair Work system. The Qantas dispute merits detailed analysis and assessment for three main reasons. First, it was probably the most significant industrial dispute to have occurred in Australia since the 1998 waterfront dispute between Patrick Stevedores and the Maritime Union of Australia. Secondly, the dispute re-focused the attention of the major political parties on issues of industrial relations regulation. After the turmoil of the period in which the Coalition government’s Work Choices legislation was in operation, and its replacement by Labor’s Fair Work laws, there had been something of a lull in the lead-up to the 2010 federal election — with both parties committing to policies of making no major changes to the major federal industrial statute, the FW Act. And thirdly, the Qantas dispute was a major test of the Fair Work system, raising arguments about whether the system sufficiently promotes productivity and supports employers’ rights to manage businesses; the ability of unions to protect their members’ jobs against the chill winds of global competition; the legality of certain industrial tactics; and the role of FWA in resolving collective bargaining disputes. In this article, we begin by examining the background to the dispute, including the respective positions of the airline and the three unions, and how the dispute unfolded (Parts II and III). We then analyse the key legal issues that arose in the dispute: the legality of the unions’ job security claims; the role of good faith bargaining; whether Qantas’s proposed lockout and grounding were legitimate; the federal government’s response; and FWA’s powers to arbitrate bargaining disputes (Part IV). Finally, we examine the key implications of the Qantas dispute for workplace regulation in Australia (Part V). Throughout the article, the discussion takes account of the findings of a government-initiated review of the operation of the Fair Work legislation, which was released in July 2012. Some of the less contentious reforms proposed by that review have already been implemented, by virtue of the Fair Work Amendment Act 2012(Cth). Among other things, FWA has been renamed the Fair Work Commission (FWC). At the time of writing, the Gillard government had not yet announced a response to many of the other recommendations contained in the review, although some further amendments have been proposed in the Fair Work Amendment Bill 2013, introduced into Parliament on 21 March 2013. Before going on to consider the various legal issues that ultimately arose in the Qantas dispute, and their impact on the broader debate about workplace regulation in Australia, it is helpful first of all to set the dispute in its commercial and industrial context and explain how it evolved. There is a tension ... at the heart of the [FW Act], which is its focus on the collective when all the indicators in the broader society, not least in the decline of actual paying union members, point towards greater variegation and individualization, and it will be interesting to watch this tension play out over coming years. As events unfolded, the Qantas dispute became a stark illustration of this ‘tension’. The fact is that union membership among the parts of the airline’s workforce covered by the TWU, AIPA and ALAEA is far higher than overall union density in Australia. And it is not just these unions that have a role within the company. As the dispute discussed in this article was getting under way, Qantas had 48 different collective agreements with 16 unions. So Qantas has been (and continues to be) bound to engage in labour relations on a ‘collective’ basis — with consequent exposure to protected industrial action during collective bargaining negotiations. To return though to the unions that featured in this particular dispute, the TWU covers ground service employees (ramp and baggage handling) and catering staff engaged by Qantas and a related entity, QCatering Ltd; the AIPA represents pilots employed on the airline’s long-haul routes; while the ALAEA covers licensed aircraft engineers. The central bargaining claims of the three unions related not to wages or other minimum employment conditions. Rather, the unions’ main concern was to guarantee the security of their members’ jobs. This was largely a response to measures taken by Qantas in recent years to obtain greater efficiencies in its operations through reduced labour costs, including through increased use of contractors and labour hire employees and the ‘offshoring’ of job functions. the Operating Agreements between Qantas and Jetconnect and the employment contracts entered into between Jetconnect and its pilots cannot be held to be shams. Even though Qantas exercises a considerable degree of control and influence over the operation of its subsidiary, this is not sufficient to disregard the separate legal personality of the subsidiary. We are proud of our profession and our airline and trust you will support us in keeping Qantas pilots in Qantas aircraft and ensuring our great iconic airline remains uniquely Australian. For more information and to register your support, please make your next destination qantaspilots.com.au. The TWU’s bargaining claims included limits on Qantas’s ability to contract out job functions, for example by restricting the proportion of contractors to no more than 20 per cent of the workforce; and the extension of enterprise agreement wage rates and conditions to any outsourced or labour hire workers. This latter type of provision is commonly known as a ‘site rates’ clause. For its part, the ALAEAsought commitments from the airline to retain the performance of maintenance functions by licensed aircraft engineers; and to continue carrying out maintenance checks on the new fleet of A380 aircraft ‘in-house’. The ALAEA was also concerned about the introduction of ‘maintenance-on-demand’ technology, which reduces the need for more regular manual checks. With further signs during 2011 that Qantas would expand its offshore operations, particularly in Asia — and reduce staff numbers — the three unions’ claims for enhanced protections of employment security were at the heart of the Qantas dispute. In the modern world, no company can promise a job for life. The best way to deliver job security is to have a strong and viable business. Qantas also sought to explain its position through advertisements in national newspapers, as the dispute increasingly came to be fought in the media as well as in FWA. As for the unions, their tactics in the dispute increasingly came to revolve around the taking of protected industrial action. Under pt 3-3 of the FW Act, employees and their bargaining representatives are permitted to organise and engage in such action in support of claims made in negotiations for a new enterprise agreement. In the absence of such statutory protection, industrial action is invariably unlawful both at common law, and under other statutory provisions. The limited right to strike, or to engage in other forms of industrial action such as work bans and ‘go slows’, is subject to many procedural requirements — including that any proposed action is approved by a majority of the relevant employees in a secret ballot. Employers may also take protected industrial action in the form of a ‘lockout’, but only in response to protected action taken by employees. This framework for the taking of lawful industrial action by parties involved in agreement negotiations sits — albeit somewhat uneasily — alongside the obligation to bargain in good faith under s 228 of the Act. consisting of the making of cockpit announcements during flights, and the wearing of red ties (in contravention of Qantas’s uniform policy). The protected action taken by ALAEA and TWU members increased in regularity in September and October 2011. Other tactics were employed by the unions, such as notifying Qantas of proposed protected action (for example, a stop-work meeting), then calling the action off at the last minute. This had the dual benefit (for the unions) of causing maximum disruption to the airline, and ensuring that their members did not lose any pay by actually taking industrial action. Qantas described this as a ‘cynical tactic’ and part of a campaign of ‘strikes — both actual and threatened — by ground handlers and licensed engineers’ that had (by mid-October) ‘caused mass disruption to our customers and our business’. By 29 October, the industrial action had resulted in the cancellation of 600 flights and seven aircraft being grounded, affecting 70 000 passengers and causing $70 million damage to the airline. In Qantas’s view, all three unions had engaged in ‘a coordinated campaign’ of industrial action that had hurt not only the company and its customers but also the broader Australian community. The unions’ strategy of taking intermittent industrial action over a drawn-out period was described by critics as the ‘slow bake’ of Qantas. Some conservative commentators maintained that this exposed a major flaw in the Fair Work system, in that unions could take protected action in the form of work stoppages, overtime bans and strikes, to bleed an employer into submission over time. This led a number of employer organisations to argue, in their submissions to the Gillard government’s Fair Work Act Review, for the introduction of new limits on protected industrial action by employees or unions — including a requirement that such action only be permitted as a ‘last resort’. We have got to achieve a resolution to this crisis. We have got to bring this to an end. So I have no option but to force the issue. I have to activate the one form of protected industrial action that is available to me to bring home to the unions the seriousness of their actions, and to get them to forge sensible deals with us. Joyce added that because the Qantas staff to be locked out were ‘essential to the running of the airline, the lock-out makes it necessary for us to ground the fleet’ immediately. As a result, flights in the air were directed to complete their sectors, but there would be ‘no further Qantas domestic or international departures anywhere in the world’. The main reason provided by the airline for the decision to ground the fleet prior to the lockout taking effect was to ensure safety. However, the motivation for the lockout was clearly (as Joyce stated) to bring the dispute to a head — by creating a circumstance in which the federal government would be forced to intervene and seek a resolution of the dispute in the national interest. Only a few hours after Qantas’s announcement of the grounding and proposed lockout on Saturday 29 October 2011, the federal government made an application to FWA under s 424 of the FW Act. The application, which was supported by the governments of Victoria, New South Wales and Queensland, sought the termination by FWA of the protected industrial action being taken, or proposed, by all parties to the dispute. The ground upon which the government sought such termination was that set out in s 424(1)(d): that the protected action was threatening, or would threaten, ‘to cause significant damage to the Australian economy or an important part of it’ — specifically in this case, the aviation and tourism industries. The effect of such a termination would be to give Qantas and each union a short period in which to conclude an enterprise agreement. Otherwise, FWA would be required to resolve the matter by arbitration. The power to use compulsory arbitration to resolve a bargaining dispute in this situation has been a feature of the federal industrial statute since 1993, when the Keating government legislated to encourage enterprise-level bargaining and introduced the concept of protected industrial action. Besides cases of significant economic damage, the power may also be exercised under s 424 where protected action is threatening the life, safety, health or welfare of the population, or part of it. The drafting of the provision has been influenced by (though does not wholly reflect) an interpretation of international labour standards relating to the right to take industrial action, whereby it is acceptable to deny ‘essential service’ workers the right to strike, provided they have access to some form of independent procedure to resolve bargaining deadlocks. In this case the federal government argued that if FWA was not prepared to terminate the industrial action at Qantas, it should at least impose a suspension of all protected action for 90 days. That would have left it open for the industrial action to resume after that period, and there would have been no process of compulsory arbitration in the meantime. On this basis, the Full Bench found that the requirements of s 424(1) were made out in respect of Qantas’s proposed lockout; and that, although protected industrial action was permissible under the FW Act, in this case the ‘primary consideration’ had to be ‘the effect of the protected action on the wider aviation and tourism industries’. This justified the immediate termination (rather than suspension) of all protected industrial action in relation to each of the proposed agreements. The effect of the Full Bench’s decision was to enable Qantas to resume normal operations (which occurred within a few days). The decision also triggered the commencement of a 21-day period (extendable by a further 21 days) during which all parties to the dispute were required to resume negotiations with a view to reaching agreements — or face the prospect of having outcomes determined by FWA. The Full Bench of FWA noted, in its decision terminating the industrial action of all parties involved in the Qantas dispute, that the tribunal could assist the parties in their efforts to reach agreements during the ‘post-industrial action negotiating period’. The FW Act does not mandate the tribunal’s involvement in such negotiations. Nevertheless, the tribunal did play a significant role in facilitating discussions in respect of each of the three proposed Qantas agreements. Despite these efforts, no agreements were reached during the 21-day period following the termination of protected action. Two of the unions (the TWU and AIPA) wanted to extend the negotiating period for a further 21 days, but Qantas preferred to move straight into arbitration. Section 266 of the Act provides that, if no agreement is reached during the post-industrial action negotiating period — and that period is not extended for a further 21 days by agreement between the parties — then the FWC (as it now is) must make an ‘industrial action related workplace determination’ under pt 2-5 div 3. This is one of the few grounds upon which the tribunal may arbitrate the outcome of bargaining disputes under the legislation, reflecting the shift away from compulsory arbitration in Australia’s industrial relations system over the last 20 years. the matters that were still at issue between the parties at the end of that period and certain ‘core’ and ‘mandatory’ terms. Following further talks after the conclusion of the post-industrial action negotiating period, Qantas and the ALAEA announced on 19 December 2011 that they had reached an agreement to resolve their dispute. The new, four-year agreement included three per cent annual pay increases — but no improvements on the job security measures contained in the previous agreement between the parties. In particular, the union acknowledged that it had been unable to secure a commitment from Qantas to retain A380 heavy maintenance functions within Australia. The agreement was submitted to FWA that day, with the parties asking the tribunal to make an industrial action related workplace determination under s 266 consisting of the terms that had been agreed between them. A Full Bench of FWA did so in a decision handed down on 23 January 2012, which endorsed the first workplace determination made under the FW Act as an ‘appropriate’ package resulting from compromise between the parties that would achieve much-needed stability. challenging the validity of FWA’s decision on 31 October 2011 ending all industrial action in the Qantas dispute. The basis of the AIPA’s challenge is discussed further below. It is sufficient at this point to note that the Full Court dismissed the AIPA’s legal challenge on 10 May 2012, with the result that the jurisdictional basis for FWA to proceed with the TWU and AIPA workplace determination matters was confirmed. On 2 August 2012, a Full Bench of FWA handed down its decision in the TWU arbitration. The outcome was widely regarded as a major victory for the airline, as the Full Bench rejected (in particular) the TWU’s claims for site rates and limits on contracting out and the use of labour hire staff. The Full Bench also recognised Qantas’s need to reduce labour costs in response to the competitive pressures at play in the domestic and international airline industry — and essentially endorsed the steps the airline had taken during the dispute, including the lockout and grounding. On the same day, Qantas confirmed that the total number of redundancies to be effected in its engineering, maintenance and catering operations amounted to 2800 jobs — although most of these redundancies had been announced previously. A separate Full Bench’s decision in the AIPA arbitration was handed down on 17 January 2013, which also found mostly in favour of the airline. The attempt by the three unions to secure commitments about the future of their members’ jobs was, as we have suggested, at the heart of the bargaining disputes that blew up in 2011. Qantas was pursuing a vision of the airline that would see a leaner and more efficient Australian operation, with key jobs increasingly sent offshore to be performed at much lower rates of pay. The unions were just as intent to stop this happening. At a broader level, this conflict was played out against the backdrop of increasing complaints by certain employer groups that the Labor government’s Fair Work regime had radically boosted ‘union power’, increased industrial disputation, and hampered attempts by Australian businesses to operate more productively. As we have previously noted, there is very little hard evidence to back up these claims, a conclusion also reached by the Fair Work Act Review. Nevertheless, the calls from some quarters for new limits on the capacity of trade unions to ‘interfere’ in the running of businesses have intensified. In particular, the idea that unions should be prohibited from even seeking to negotiate restrictions on outsourcing has become a totemic issue for bodies such as the Australian Industry Group (‘AiG’). At the core of this debate is a legal issue that has created uncertainty for over a century. Under the Conciliation and Arbitration Act 1904 (Cth), the federal industrial tribunal could only deal with disputes concerning ‘industrial matters’, a term defined in s 4 to include ‘all matters pertaining to the relations of employers and employees’. This spawned a series of confusing and often contradictory High Court decisions that sought to draw a line between matters directly pertaining to the employment relationships at issue, and those having merely an ‘indirect’ or ‘consequential’ effect. In particular, the Court struggled to settle on a consistent view on whether matters that appeared to be ‘managerial’ in nature could legitimately be the subject of industrial disputation, and hence regulation by award. During the 1980s, the Court rejected the idea of a simple distinction between ‘industrial’ and ‘managerial’ matters, ruling that claims could be made about issues such as staffing levels. But by 1994 it had reverted to a narrow and technical approach that suggested it might be hard for matters of collective concern to employees to be regarded as ‘industrial’. Despite the shift that occurred in the 1990s away from the arbitration of industrial disputes, and in favour of the setting of wages and employment conditions by registered workplace agreements, such agreements were still required to deal with matters pertaining to the relations of the employers and employees in question. In 2004, the High Court confirmed in Electrolux Home Products Pty Ltd v Australian Workers’ Union that if a particular matter did not satisfy the ‘matters pertaining’ test, it could not validly be the subject of a registered agreement, and nor could employees take protected industrial action in relation to any proposed agreement that included a ‘non-pertaining’ provision. might otherwise have satisfied the matters pertaining requirement. Together with the Electrolux ruling, this led unions to seek to enter separate or ‘side’ agreements to deal with matters of mutual concern that could not now be included in a statutory agreement. Qantas was just one of many companies that were prepared to go along with this strategy. Such unregistered agreements were only enforceable, if at all, at common law. management’ — an idea that, as noted above, the High Court had expressly repudiated in the 1980s. representative concerned is regarded as not ‘genuinely’ seeking to reach agreement. Returning to the issues that arose in the Qantas dispute, there has been perennial debate about whether a claim to restrict an employer from outsourcing labour to a subsidiary, contractor or labour hire agency can be said to ‘pertain’ to the relations between the employer and the employees who would otherwise be performing that work. Based on a pair of earlier High Court decisions, a crucial distinction has come to be drawn between restricting the use of outside labour, and imposing conditions on such an arrangement. requirement that an employer advertise any job vacancies internally and contract out a position only if it is not wanted by an existing employee. Nor can it require an employer to ensure that any entity to which the employer outsources work has a union-approved agreement. It is important to note that under the Work Choices legislation that was in force from March 2006 until July 2009, the prohibited content rules did not just preclude registered agreements from restricting the engagement of contractors or labour hire workers, but also from including any ‘requirements relating to the conditions of their engagement’. This plainly covered site rates provisions. It is this position that groups like the AiG have been seeking to restore, on the basis that clauses of this type ‘restrict legitimate commercial arrangements between contractors and subcontractors’ and ‘inhibit the productive and cost-effective organisation of work’. However, the Fair Work Act Review rejected this and other proposed changes to the content rules for agreements, on the basis that ‘the matters pertaining formulation ... accords a fair balance between the prerogative of management to manage and the reasonable desires of employees to jointly govern their terms and conditions of employment’. It also noted analysis showing that under the new agreement content rules, clauses regulating the use of contract labour had actually become less common, compared to the pre-Work Choices system. In its own submission to the Review, Qantas argued that the removal of the Work Choices prohibited content rules had directly resulted in union bargaining claims that‘sought to regulate, control and reduce Qantas access to third party labour and or business services and to control Qantas business strategy and the opportunities for the business to improve productivity’. This suggests an acceptance that the claims in question were entirely legitimate under the FW Act. But as noted earlier, one of the TWU’s demands was that contractors should make up no more than 20 per cent of the relevant part of Qantas’s workforce. On the basis of what has just been explained, this would not have satisfied the matters pertaining requirement — and indeed Qantas argued as much during the arbitration proceedings that ultimately resolved its dispute with the TWU. As it transpired, the Full Bench rejected the claim on ‘merits’ grounds rather than addressing the jurisdictional issue — a point to which we return later on. But it remains notable that Qantas did not seek at a much earlier stage to raise this issue, since it would have provided a basis for arguing that any industrial action taken by the TWU was unprotected, and therefore amenable to a ‘stop order’ by FWA under s 418 of the FW Act. A similar point can be made about the ALAEA’s demand that Qantas build a new A380 maintenance facility in Australia, which would seem even more clearly to lack the requisite connection to the employment relationships of ALAEA members. The failure to raise the matters pertaining issue earlier highlights the fact that, despite Alan Joyce’s complaints, Qantas evidently saw its long-term interests as being advantaged by the ‘damaging’ industrial action being permitted to go ahead. It also underscores the highly strategic nature of some employers’ objections to the Act’s agreement content rules. This was further emphasised by the revelation that Qantas was quite prepared to accede to certain union demands — so long as the commitments were expressed in a ‘side’ agreement, rather than in a statutory agreement or determination. B Good Faith Bargaining: ‘Missing in Action’? One of the more notable features of the current enterprise agreement regime is its imposition on bargaining representatives of a requirement to negotiate in good faith, enforceable through ‘bargaining orders’ issued by the FWC. According to the Fair Work Act Review, while ‘the law on good faith bargaining is still developing’, the new bargaining principles have to date been applied in a ‘flexible and responsive’ way and ‘appear to be operating effectively to promote positive bargaining’. The review panel also noted that there have been relatively few applications for bargaining orders since the new legislation took effect in July 2009, suggesting that ‘most parties voluntarily conduct bargaining in accordance with the principles’. It is clear that a good deal of bargaining took place between Qantas and the three unions with which it was in dispute, even during periods when industrial action was being taken. In the case of the ALAEA, for example, negotiations commenced in August 2010 and over the ensuing 15 months there were 47 formal bargaining sessions, not to mention other meetings involving the bargaining representatives. From the time that the ALAEA started taking industrial action in May 2011, until the action was terminated some six months later, 18 conciliation conferences were convened by FWA to assist the parties in reaching a resolution. It can be expected that bargaining in a hotly contested dispute will be robust and that parties will take steps to bring about a desired result that the other party will regard as unreasonable or uncalled for. Action which is provided for in the Act, of itself, will usually not amount to a breach of the legislation’s good faith bargaining requirements. One may be critical of the amount of industrial action engaged in by both parties and the damage it caused to them, each other and the community generally. However it is quite a different thing to contend that the action was capricious or unfair and undermines collective bargaining. We do not think any of the actions of the parties can be so described. union tactic, mentioned earlier, of notifying the company of industrial action, then calling it off. There is nothing in the Act that specifically forbids this. But as the Fair Work Act Review noted, there is also nothing to prevent employers from seeking to characterise this ‘aborted strike technique’ as a breach of the good faith bargaining requirements. Since this possibility had not been fully explored yet, the Review declined to recommend any changes to the Act to deal with the issue, despite accepting that the tactic had been used ‘inappropriately’ by some unions. genuinely trying to reach agreement. This is a concept that has been part of the legislation since the idea of protected action was introduced in 1993 and it has been noted that there is a considerable overlap with the more recently introduced notion of good faith bargaining. But it is also not hard to imagine circumstances in which a party may adopt unfair bargaining tactics that breach the good faith bargaining rules, yet still be able to establish that they are genuinely trying to reach agreement. Of course, FWA’s approach to the bargaining conduct of the parties in the Qantas dispute can be seen as entirely consistent with the non-interventionist role that the applicable legislation has accorded the federal industrial tribunal since enterprise bargaining commenced in the early 1990s. The logic has been, and remains under the FW Act, that the tribunal should play only a facilitative role in a system premised on agreement-making between the parties, rather than the central role it occupied in the conciliation and arbitration era. To a large extent, FWA’s ‘hands were tied’ in the Qantas dispute, leaving it relatively powerless to intervene. When FWA was ultimately called upon to express a view about the bargaining tactics deployed by the parties in the TWU arbitration decision, it essentially endorsed their ‘gloves off’ approach. Once again, this outcome reflected the tribunal’s very limited capacity to step in and resolve bargaining disputes — and also the legislative context, which allows protected industrial action to be taken despite the parties’ obligations to bargain in good faith. trying to reach agreement) a prerequisite to taking industrial action, and/or to give the tribunal an explicit discretion to halt protected industrial action and issue a bargaining order instead, where that would better promote the reaching of agreement. We would not dispute FWA’s observation that taking protected action — which is, after all, a right expressly accorded to bargaining participants — should not ordinarily be treated as a failure to bargain in good faith. We also accept that ‘robust’ or ‘hard’ bargaining is an inevitable concomitant of a system that promotes negotiated rather than arbitrated outcomes. Nevertheless, a more integrated approach would recognise that there are times when parties should be induced or required to adopt a more collaborative approach to bargaining, rather than simply using their industrial muscle. It will be recalled that FWA’s decision to terminate the industrial action at Qantas was based on its belief that the proposed lockout by the company, but not the prior industrial action taken by its employees, threatened the degree of economic harm necessary to satisfy the requirements of s 424 of the FW Act. That, however, focused attention on the question of whether the lockout fell within the definition of ‘employer response action’ in s 411. If not, it would not have constituted protected industrial action — and the power under s 424 can only be exercised in relation to protected action. On the face of it, there was a lack of proportionality between the company’s complete shutdown of its business and the industrial action previously taken by the unions — especially in the case of the AIPA, whose members had done no more than wear red ties and make cabin announcements. The question then was whether the lockout could be said to be ‘organised or engaged in as a response’ to the employee action, as required by s 411(a). This point was not pressed at the time with FWA itself. The unions instead concentrated on arguing that the ‘disproportionate’ nature of the company’s response warranted the suspension rather than the termination of the industrial action at Qantas. But the AIPA subsequently argued before the Full Federal Court that because Qantas had not proposed to engage in employer response action, FWA lacked the jurisdiction to make the order it did. If successful, this would have had the effect of quashing the decision to terminate, restoring the capacity to take industrial action and removing any basis for arbitration of the dispute — at least in relation to the AIPA. s 413(7) of precluding any other action in relation to the same proposed agreement. The key issue then was whether FWA had made a jurisdictional error in relation to its order terminating Qantas’s action. The Court held unanimously that, even if the existence of employer response action constituted a ‘jurisdictional fact’ that acted as a precondition to the exercise of FWA’s jurisdiction, Qantas’s lockout satisfied the requirements of s 411(a). the employee claim action. All that is required is that it is a response. The threshold is low. It is interesting to contrast this observation about the ‘opportunistic’ nature of Qantas’s behaviour with the comments by both Lander J and Buchanan J that what the company did was the ‘only’ step or legitimate response available to it in the circumstances. In fact, as Alan Joyce himself conceded (despite also saying he had ‘no other option’ than to fight back), Qantas had at least two other choices: give in to the unions’ job security demands, or continue to endure a drawn-out industrial campaign. There were also other options available to it under the FW Act, including to seek a suspension of the union’s industrial action under s 425, which permits the tribunal to impose what is in effect a ‘cooling off’ period in order to allow negotiations to proceed. What should also be emphasised is that while the legal basis for the termination may have been provided by the lockout and its threatened effects, it was the immediate grounding of the Qantas fleet and the suspension of all commercial operations that in reality prompted the government to intervene. It has been widely assumed that the motive for Qantas escalating the dispute so radically was to create a crisis that could only result in the dispute being sent into arbitration by FWA. Qantas and its legal advisers evidently judged that they would do better out of an arbitration process than at the bargaining table — particularly given the prospect of a long campaign of damaging, ‘slow-bake’ industrial action. As matters have transpired to date, that judgment appears to have been vindicated. From that perspective, it was the grounding, not the lockout that never technically commenced (since all industrial action was terminated before the lockout was due to start) which did the trick for the company. The significant point about the grounding was that it did not just affect the three groups of employees involved in the disputes, but everyone else in the company, including short-haul pilots, cabin crew and administrative staff. The precise legality of the company’s actions in relation to these other workers was unclear at the time, and has remained so since. It would plainly have been possible for the company to have stood many of them down after the lockout had commenced, on the basis that without engineers and ground crew even domestic flights would have had to be cancelled, leaving other affected workers with no useful work to perform. But that would not have applied to everyone, and certainly not before the lockout had started. According to Lander J, the grounding was not itself a lockout and therefore could not constitute industrial action under the Act. Rather it was ‘a commercial decision made as a consequence of taking industrial action’ that ‘had no economic consequences upon the employees’. The basis for this latter observation is unclear, given the lack of information (publicly at any rate) about whether the affected employees would continue to be paid. As it was, the question of whether Qantas had the power (whether contractually or otherwise) to call a halt to all work before the lockout has not — at least to our knowledge — been the subject of legal argument. Justice Lander did comment, on the other hand, on the ‘curiosity’ of Qantas being able to argue that its own industrial action should be terminated. Indeed it seems clear that if the government had not made the application to FWA that it did, Qantas could and would have moved to take that step. There is nothing in s 424 that obviously prevents a bargaining representative from making an application based on its own conduct. This aspect of the Qantas affair has certainly generated criticism from the union movement, with many officials commenting about the unsatisfactory nature of a system that effectively allowed the company to harm itself in order to send the dispute into arbitration. But it should be noted that if it had been the employees and their unions who had seen a tactical advantage in pursuing arbitration rather than negotiation, they could have achieved exactly the same effect by calling an indefinite strike. As it is, when it came to the review of the legislation, unions focused on the desirability of amending the Act to require employers to give the same notice of a lockout as required of employees (that is, three clear working days), and to make it clear that any lockout must constitute a ‘reasonable and proportionate response’ to the employee action that has preceded it. However, the review panel did little more than note these suggestions, dismissing them with the curt observation that the Act was ‘operating as intended’ in relation to employer industrial action. div 3. The Minister may also follow up a declaration by giving directions to specified employees or bargaining representatives that will have the effect of removing or reducing the relevant threat of harm. The opposition suggested that the s 431 power should have been exercised well before Qantas escalated the dispute, or at the very least could have been used on the day the grounding was announced, rather than leaving the matter to FWA. Ministerial power to terminate industrial action will be restricted to ‘essential services’ only. This is likely to have a neutral impact, as, to date, the Ministerial power to stop industrial action has never been used. This will also help ensure the independence of FWA. The first reason given was that any attempt to invoke the provision would simply have invited a legal challenge from the unions to a power that had never previously been used. Section 431(3) makes it clear that a ministerial declaration is not a legislative instrument, and as such would not have had to be laid before Parliament for possible disallowance. But there is every reason to believe that any exercise of the power could have been the subject of an application to the High Court or the Federal Court for judicial review, on a variety of administrative law grounds. In particular, had the Minister issued a declaration without first giving all affected parties a reasonable opportunity to express their views, or without giving proper reasons, this would likely have been treated as invalidating the decision. Importantly too, anyone challenging the Minister’s decision would probably only have needed to establish a prima facie case as to its invalidity, in order to secure an interlocutory injunction restraining either the Minister or FWA from acting on the purported declaration. In circumstances where the Minister is permitted to make application to FWA to obtain the same outcome, with the benefit of an independent decision maker hearing evidence and submissions from the parties, we consider that the exercise of this power would lack legitimacy. At the time of writing, it remained to be seen whether the Gillard government would act on this proposal. The focus of the Fair Work Bill will continue to reflect the move away from the automatic arbitration of disputes by the industrial umpire ... But there are of course circumstances when bargaining ‘goes off the rails’ and when the industrial umpire will need to step in. This is reflected in the provisions of the FW Act, under which the tribunal can arbitrate bargaining disputes where all parties agree, after the termination of protected industrial action, following serious breaches of the good faith bargaining obligations, or where the parties are unable to negotiate a multi-enterprise agreement covering low-paid employees. We have noted earlier that Qantas’s actions in grounding its fleet and proposing to lock out employees covered by the TWU, ALAEA and AIPA were intended to create the circumstances in which protected industrial action would be terminated by FWA — and, ultimately, FWA would be able to arbitrate the three bargaining disputes. The steps taken by the airline triggered renewed debate about the role of arbitration in bargaining under the FW Act. In the immediate aftermath of the grounding, union representatives argued that the Qantas case illustrated a ‘loophole’ in the legislation which allowed a multinational employer to obtain arbitration by locking out its workforce — while the tests for employees or unions to access arbitration were too difficult to meet. The ALP indeed subsequently varied its policy platform, with the support of the then Workplace Relations Minister, to call for FWA to be given greater power to arbitrate ‘protracted and/or intractable bargaining disputes’. Employer spokespersons and conservative commentators, by contrast, appeared somewhat divided on the issue. Some felt the Qantas dispute showed that an employer had to take quite extreme steps in order to gain access to arbitration — and therefore the tests should be relaxed. Others argued that there should be no return to compulsory arbitration, as it is incompatible with the notion of enterprise bargaining and the goal of workplace productivity. The evidence on the operation of the limited provisions under which the tribunal is currently empowered to arbitrate bargaining disputes indicates that they are very rarely utilised. The Qantas affair provides one of the few instances to date of the tribunal having to arbitrate to resolve a dispute following the termination of protected industrial action, although in a number of cases parties have been able to reach agreement either just before or during such arbitration. There have been no applications, to date, for the tribunal to make a bargaining-related workplace determination or a low-paid workplace determination, not least because the tests for accessing these provisions are so difficult to satisfy. Voluntary arbitrations under s 240(4) have also been very few in number. There is a strong argument for adjusting the tests for accessing arbitration under the FW Act, so that the emphasis is not so much on establishing extreme bad faith (or ‘fault’) by one party, or that industrial action by one side is causing so much damage to the other that it should be ended. Rather, one of the tests for access to arbitration should be focused on whether parties — having negotiated with each other in good faith — have reached the point where further negotiation is unlikely to be productive. However, the review panel was reluctant to expand the tribunal’s compulsory arbitration powers unless it could be shown that this was necessary to address a failure of the Fair Work bargaining system. The panel rejected the case for making such a change, because (in its view) the potential of good faith bargaining orders and the low-paid bargaining stream to deal with intractable disputes had not yet been fully explored. those involving Cochlear and Endeavour Coal. In any event, at the time of writing, the government had not yet formally responded to these recommendations of the review panel. There have been reports that the government is prepared — contrary to the panel’s view — to countenance arbitration being available for certain ‘intractable’ disputes. But provisions to this effect were dropped at the last minute from the Fair Work Amendment Bill 2013 introduced on 21 March 2013, pending further consultation on the issue. As for the outcome of the TWU arbitration in the Qantas dispute, we have already noted that the FWA Full Bench decision on 2 August 2012 was a resounding victory for the airline. Not only were the TWU’s key job security claims rejected, but the Full Bench also awarded a three per cent per annum pay increase rather than the five per cent increases sought by the union. The decision is significant, with potential ramifications for future instances where the FWC is required to make workplace determinations under the FW Act, for the following reasons. First, the decision strongly endorses the position taken by Qantas in resisting the union’s claims for site rates, limits on the use of contractors and labour hire, and other job security protections. The decision is full of references to the competitive pressures Qantas faces in the domestic and international airline industry, and acknowledges its need to respond to these pressures. The clearest indication of the Full Bench’s approach is its statement that: ‘Ultimately it is in the interests of both Qantas and its employees that Qantas operates a viable and competitive business and is able to retain, attract and reward skilled and motivated employees.’ This is not dissimilar to the language used by Alan Joyce himself during the dispute. The Full Bench also treated as relevant the fact that the terms and conditions of Qantas employees ‘are among the highest of comparable employees in the airline industry in Australia’. Secondly, the decision contains important observations about the tribunal’s role in making a workplace determination, and how it should approach the factors set out in s 275 of the FWAct that guide its exercise of this power. The Full Bench followed a 1998 decision of an AIRC Full Bench in Automotive Food, Metals, Engineering, Printing and Kindred Industries Union v Curragh Queensland Mining Ltd,indicating that the role of the tribunal is to assess the parties’ respective positions in relation to the matters at issue and ‘arrive at a conclusion that would be regarded as appropriate ... had the bargaining concluded successfully’. [t]he determination of how to engage labour, the extent to which contractors are utilised and the numbers of employees to be engaged in various categories are classically regarded as matters properly to be determined by the management of an enterprise. Finally, the TWU arbitration decision essentially vindicated Qantas’s strategy and tactics during the dispute. The Full Bench found that so long as parties engaged in lawful conduct, including exercise of their rights under the FW Act, then their conduct would not be considered unreasonable. This included Qantas’s proposed lockout and grounding of the fleet, which were neither unreasonable nor in breach of the good faith bargaining requirements. The Full Bench’s endorsement of robust negotiation tactics in bargaining under the FW Act is consistent with the tribunal’s approach under previous federal legislation, summarised in one well-known decision with the description ‘all is fair in love and war’. A poll published on 7 November 2011, in the wake of the Qantas grounding, revealed that 55 per cent of the public approved of FWA’s handling of the dispute, followed by (in order) Qantas workers, Prime Minister Gillard and her government, Alan Joyce, opposition leader Tony Abbott and, last of all, the union leaders involved. So if there were any winners out of the Qantas dispute, as far as the public was concerned it was the ‘independent umpire’, and to a lesser extent the government for its decisive intervention. For many who follow industrial relations more closely, there is probably a tendency to see Qantas as the winner, based in particular on the outcome of the TWU and AIPA arbitrations. Its legal strategy was plainly to avoid trying to narrow its workers’ industrial action (as it might otherwise have been able to do), let that action take its toll for long enough to justify a response, then fight back in such an extreme way that the government and/or FWA would have no real option but to send each bargaining dispute into arbitration. This is exactly what FWA did, at the government’s behest. And if the company was banking on getting out of the resulting proceedings with no real concession to the union’s job security claims, other than those it was already prepared to offer, then that faith has clearly been rewarded. Certainly, the airline regards itself as the victor in the dispute — although, not surprisingly, this view is contested by some of the other protagonists, such as the TWU and AIPA. It may be in the end that there was only one undisputed winner from the affair: Qantas’s main rival, Virgin Australia. In August 2012, Virgin posted a net annual profit of $22.8 million, a turnaround of over $90 million from the previous year’s loss, and one recorded during what are otherwise very difficult times for the airline industry. It also claimed an increased market share, especially in the lucrative corporate travel sector. What though of the broader implications of the Qantas dispute for the workplace relations system in Australia? An immediate assessment of FWA’s response to the grounding and proposed lockout would have given a tick to both the umpire and the legislation it was administering. Arguably, the system had worked exactly as it was intended, with FWA moving to balance the interest that workers and employers have in being able to take industrial action in support of their bargaining claims, with the public interest in the protection of health, safety or (in this case) the national economy. But there was also a sense at the time that the dispute was likely to have longer-lasting ramifications, especially in supporting moves to re-examine some of the key aspects of the Fair Work legislation discussed in this article: the permissible content of agreements, the use of protected industrial action by employers and unions, and the mechanisms for the resolution of intractable bargaining disputes. Social media are playing an increasingly large role in the way campaigns communicate with voters. In January 2016, 44% of U.S. adults reported having learned about the 2016 presidential election in the past week from social media, outpacing both local and national print newspapers. Moreover, as of July, 24% say they have turned to the social media posts of Donald Trump or Hillary Clinton for news and information about the election – more than those who turn to either of the candidates’ websites or emails combined (15%). 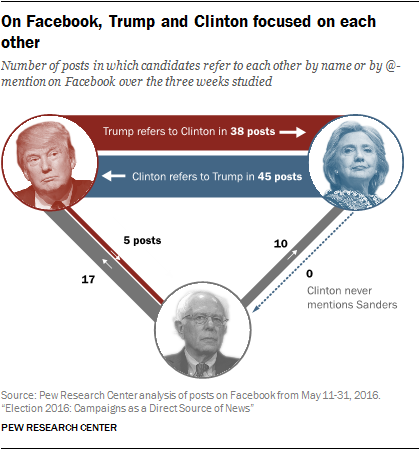 A new Pew Research Center analysis of three weeks of the candidates’ Facebook and Twitter accounts finds both similarities and differences in the ways Hillary Clinton, Donald Trump and Bernie Sanders use these still relatively new campaign tools. The study of 714 tweets and 389 Facebook posts made by the candidates between May 11 and May 31, 2016, finds that the three candidates post at similar rates but differ in the focus of these posts and in the attention they receive from the public. 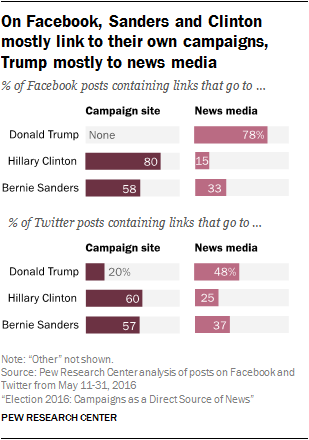 On Facebook, Clinton and Sanders mostly use links to highlight official campaign communications while Trump links frequently to the news media. On Twitter, Trump stands out for retweeting ordinary people more often than Clinton or Sanders (though retweets are rare). Videos, meanwhile, appeared in about a quarter of Clinton’s social media posts, compared with about one-in-ten of Trump’s; Sanders used video far more on Facebook than on Twitter. Finally, on both platforms, when the candidates mention their opponents, Clinton and Trump focus on each other while Sanders goes largely unmentioned. Overall, people who follow these candidates on social media see the daily cycle of the campaign through a narrow window. Candidates naturally select messages beneficial to their campaigns to share with followers. While Clinton mostly passes on messages crafted by the campaign itself, Trump reaches out to news media and the public. Sanders employs a mix of campaign communications and news media in his posts. These are some of the findings from an analysis of the candidates’ social media activity during a period in the campaign when Trump had become the presumptive Republican nominee and Clinton was still trying to secure the Democratic nomination as Sanders fought on. Content was collected from the Twitter and Facebook API and hand-coded by a team of researchers. (For more information, see our methodology – LINK]). Over the three weeks studied, Donald Trump, Hillary Clinton and Bernie Sanders posted on Facebook and Twitter at roughly similar rates, averaging five to seven posts per day on their Facebook pages and 11-12 posts per day on their Twitter accounts. While the candidates’ level of posting was about the same, public response was far from equal. In every measurable category of user attention – Facebook shares, comments, and reactions, as well as Twitter retweets – the public responded to Donald Trump’s social media updates more frequently on average than to either of the other candidates’ posts. 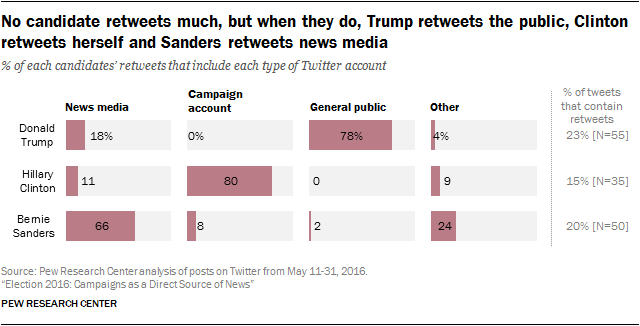 Trump’s posts on Twitter, for example, were retweeted almost 6,000 times on average compared with just over 1,500 for Clinton and almost 2,500 for Sanders. This may be due in part to Trump’s higher number of followers. Near the time of publication, he had almost 10 million followers on Twitter compared with Clinton’s 7 million and Sanders’ 3 million, while on Facebook, 9 million followed Trump’s official page, about double the number who followed either Clinton’s or Sanders’ pages. Both Trump and Sanders had a few posts that received outsized responses. Sanders’ declaration on Twitter that he would debate Trump, for example, had received roughly 28,000 retweets at the time of the study, while a Facebook post from Sanders celebrating Native Americans received over 52,000 shares. And Trump’s tweet attacking Clinton on gun control had received about 16,000 retweets, while his Facebook post supporting police was shared over 72,000 times. Comparatively, Clinton had no breakout posts or tweets in this period, instead collecting a fairly steady number of interactions on her posts and tweets. Her most retweeted tweet, about drought conditions in California, had received about 5,600 retweets at the time of analysis, while her most highly shared Facebook post was a video attacking Donald Trump that was shared 15,000 times. Even accounting for the posts that drew overwhelming attention, Trump still received the most public response. Looking at the median – or middle point – rather than the average number of interactions per posts puts less weight on the extremes, and under this metric, Trump maintains his top position. The public response in 2016 is a little harder to compare due to the substantial differences by candidate as well as a slight change in the study’s methodology across time. However, it is worth noting the overall numbers as a general reference point. In 2012, Obama’s Facebook posts received over 40,000 likes on average, while Romney’s received about 19,000; on Twitter, both received fewer than 600 retweets per post. In terms of total followers, Obama’s 2012 campaign had a much larger number of followers than the 2016 candidates as well as his own rival at the time – though much of this almost certainly stems from the fact that Obama was a sitting president running for a second term. At the time of the 2012 analysis, Obama had more than 27 million Facebook followers and about 18 million Twitter followers across his two accounts. This is far higher than Trump, the 2016 candidate with the highest number of followers (10 million on Twitter and 9 million on Facebook). Romney had about 3 million Facebook and about 800,000 Twitter followers in 2012, far fewer than any 2016 candidate. One common practice in social media is to add links to external web pages, news articles or other online material when creating a post. In the context of a political campaign, a link within a social media post can help a reader find more information, become more involved with the campaign or lend credibility to the post’s content. During the time period analyzed, the use of links by Trump, Clinton and Sanders varied, both from one candidate to the next and across the two social networks studied. Within their Facebook posts, the candidates included external links at similar rates: 30% of Clinton’s posts on Facebook included links, as did 32% of Sanders’ posts and 30% of Trump’s posts. What they linked to, however, varied a great deal. Like Obama and Romney in 2012, Clinton’s and Sanders’ Facebook feeds most often linked to their own official campaign websites or social media accounts. Fully 80% of Clinton’s Facebook posts with links went to campaign pages, as did 58% of Sanders’ Facebook posts. These include links to campaign events, videos (both recorded and streaming) and donation pages. Links to news media outlets were considerably less common for these two Democratic candidates. Only 15% of the posts with links in Clinton’s Facebook feed directed readers to news articles. In comparison, news media links from organizations such as Politico, Univision and medium.com comprised a third (33%) of posts with links in the Sanders feed. Trump’s Facebook posts, on the other hand, more frequently pointed readers to news media. Fully 78% of his posts with links directed followers to articles from large national or international media organizations such as Fox News and the Daily Mail, as well as more niche sites like the conservative magazine The American Spectator. Trump never linked to his campaign site in a Facebook post. This seems to be in line with Trump’s general strategy of focusing on media appearances and rallies during this period, rather than volunteers or donations. On Twitter (where Clinton and Sanders include links about a third of the time and Trump just a tenth), a similar pattern emerges. Sanders most often linked to his own campaign websites (57% of all links) followed by news media (37%), roughly the same rate as he did on Facebook. Clinton similarly linked to her own campaign 60% of the time on Facebook and the news media a quarter of the time. And Trump again linked most frequently to news sites (48% of posts with links), although, in contrast to Facebook, he did link to his campaign site on Twitter in 20% of all links he posted. Another way of engaging with others on social media is to directly repost content posted by someone else – whether a media organization, another political figure or a member of the public. 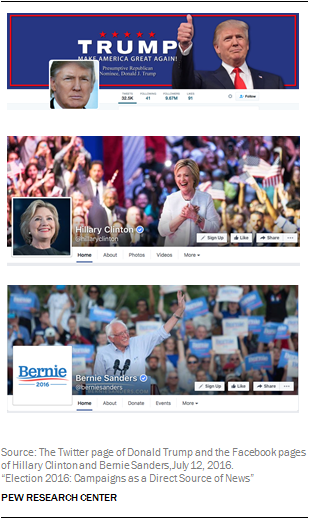 On Facebook, Sanders was the only one of the three candidates to share someone else’s posts during these three weeks studied – and he only did so twice. On Twitter, however, all three did at least some promotion – or retweeting – of outside content. About a quarter (23%) of Trump’s tweets were retweets, as were one-in-five of Sanders’ and 15% of Clinton’s. The candidates’ retweets, however, reflected different strategies. Trump was most likely to retweet the public, Clinton her own campaign accounts and Sanders the news media. Of Trump’s 55 retweets, about eight-in-ten (78%) were of people who were not famous and had no discernable ties to news media, government or other organizations – in other words, the general public. Most were of supporters offering congratulations or compliments to Trump, to which he often responded at the end of the post (see example). Some, though, were posts that made critical statements about others; Trump has taken some criticism for these types of retweets. In a May debate, for example, Fox News host Megyn Kelly questioned Trump about his retweets of derogatory statements about Kelly made by private citizens. Sanders, on the other hand, is the most likely candidate to retweet news media (66% of his 50 retweets). Another 24% of his retweets were of other types of accounts, including 12% that were celebrity accounts. In contrast, Clinton never retweeted a celebrity account. Trump’s unique engagement with the public on Twitter stands apart not just from the other 2016 candidates but also from past presidential campaigns. In 2012, the candidates’ social media outreach offered little engagement with the public. Just 3% of Obama’s tweets during the period studied were retweets of the public – and most of these were posted during a live Twitter Q&A. Romney rarely used the retweet functionality and never retweeted the public. Facebook and Twitter users can refer to others on the site in a few different ways. One is by directly linking to their accounts in a post. On Twitter, these are called @-mentions. There is no formal name for this functionality on Facebook, but the process and effect are largely the same. Short of this formal mention, a user could simply refer to that person or organization by name in plain text. Each carries a somewhat different message. The links, or @-mentions, alert the individual or organization of the reference and can direct readers to the accounts mentioned. By including this link instead of just their name, the original user can include other users in the conversation, acknowledge their contributions or direct followers to their accounts. In contrast, when a user refers to another individual without the link to their account, it suggests that the discussion is intended for only the original user’s followers. The 2016 candidates used a combination of these approaches in mentioning their opponents, while only Trump and Clinton regularly used the formal mention functions to refer to other users on Facebook and Twitter. When it came to Sanders, more interactions occurred on Facebook between Sanders and Trump than between the two Democratic rivals. Clinton never mentioned Sanders using either format while Trump mentioned him only five times, usually to boost Sanders’ campaign at the expense of Clinton’s. Sanders mentioned Trump more often (17 times) than Clinton (10 times) but named neither Clinton nor Trump at the rates they mentioned each other. On Twitter, the focus was again on Trump and Clinton referring to each other, but here, Clinton referred to Trump at twice the rate that Trump referred to her. Fully 40% of Clinton’s tweets referred to Trump (whether by name or using an @-mention), compared with 19% of Trump’s tweets that mentioned Clinton – the majority of which again used the “Crooked Hillary” nickname. Aside from this, the pattern remained mostly the same. Clinton never referred to Sanders, while Sanders mentioned Clinton about half as often as he mentioned Trump (10 times to 19 times). And Trump referred to Sanders in 5% of his tweets – again, most of which were supportive of Sanders’ efforts to beat Clinton. In these mentions, the candidates only rarely used the @-mention function. Trump used Clinton’s and Sander’s Twitter handles in an @-mention only once each; Sanders also used an @-mention one time for each candidate. Clinton did so more frequently, but still very rarely: 16 of Clinton’s 92 tweets referring to Trump did so using an @-mention. While the candidates did not often refer to each other using the formal mention functionality built into Facebook and Twitter, both Trump and Clinton used this method to highlight other users. Trump formally mentioned another user 29 times in his Facebook posts. As with his links, the news media got the most attention, making up 38% of his user mentions. His second most-mentioned category was family members (28% of his mentions), naming his daughter Ivanka four times, his son Donald Jr. three times and his son Eric once. Celebrities, from musician Billy Joel to golfer Jack Nicklaus, made up 17% of his mentions, while politicians made up just 14%. Clinton, on the other hand, mentioned other users 33 times in her Facebook posts, with politicians accounting for about half (52%) and news media accounting for just 12%. She mentioned celebrities roughly as often as Trump did (18% of her mentions), but she focused on considerably different people, mentioning TV host Ellen DeGeneres and musicians such as John Legend, Ricky Martin and Andra Day. On Twitter, the pattern was largely the same, though neither celebrities nor family members were present in the same numbers. Trump @-mentioned other users 112 times. In these mentions, he focused largely on the news media, naming media outlets or journalists in about three-quarters (72%) of his @-mentions. Most informed followers of a TV news appearance, highlighted news stories about himself or his issues, or attacked particular outlets. The New York Times was the most frequent target of the latter type of mention, especially in the wake of an investigation it published into Trump’s relationship with women. Clinton, however, named the news media in only 16% of her 50 formal mentions. She was most likely to mention other politicians (46%), including Trump, but also other prominent politicians such as President Barack Obama or former House member Gabby Giffords. On both Facebook and Twitter, Sanders used the mention functionality less frequently. He formally mentioned another user in less than 10% of both his Facebook posts and his tweets. The vast majority of posts from all candidates were written in English. However, Donald Trump’s campaign posted only in English, while both Hillary Clinton and Bernie Sanders occasionally posted in Spanish during the time period studied. 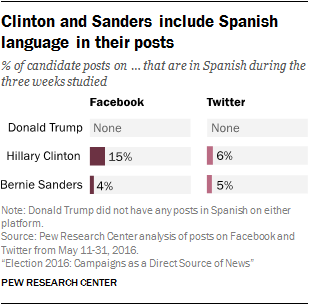 Spanish language posts constituted 15% of Clinton’s Facebook posts and 6% of her tweets, while 4% of Sanders’ Facebook posts and 5% of his tweets were in Spanish. This is reflective of the campaigns’ outreach to Spanish-speaking communities, particularly in California, which voted soon after the end of the collection period. Spanish language posts ranged from tweets sharing Spanish-language news media to messages targeted to Spanish-speaking communities – sometimes direct translations of English-language posts. Since 2012, both Facebook and Twitter have enhanced their video capabilities, making it easier to include multimedia and adding features such as autoplay, which plays embedded videos as users scroll through their feeds without user input. Amid these developments, Clinton stood out for using videos most frequently. About a quarter of both her tweets (27%) and her Facebook posts (23%) during the time period studied contained embedded videos. Sanders included videos in about one-in-five of his Facebook posts (21%) but only 9% of his tweets. Trump was the least likely to include videos on either platform, doing so just four times on Twitter (2% of his tweets) and in 13% of his posts on Facebook. Generally, the videos both Clinton and Sanders posted were campaign ads. Sanders, however, was almost equally likely to post footage (or, in one case, a live stream) from his rallies. On Facebook, Clinton also posted videos showing the candidate talking with voters about policy issues in small groups. Trump’s handful of videos were generally of news footage or interviews with himself or members of his campaign. Compared to 2012, Clinton and Sanders posted videos on par with or more frequently than either Romney or Obama did on Facebook or Twitter. Beyond video, one novel social media technique used by the campaigns, not found in our studies of previous elections, was the use of images with prominent text and/or numbers to convey factual or message-based information. Trump, for example, occasionally posted screenshots of polls or other news-related information. Clinton also posted screenshots, which were mostly text-heavy infographics designed around a single factoid or slogan such as “Two thirds of Americans earning the minimum wage are women.” The static images used by Sanders, on the other hand, tended to be infographics that shared information about rallies or voting, or conveyed celebrity endorsements. These kinds of static image-based posts can quickly convey information or messages to followers, but since they often do not include links, can make it difficult for users to confirm or find additional information.